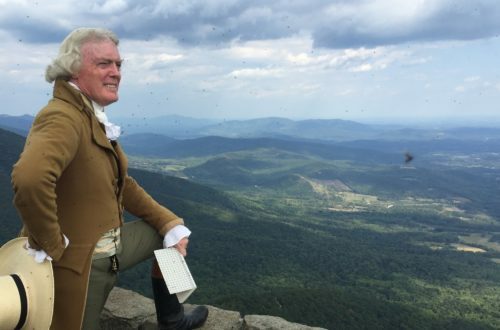 Bill Barker, who portrays Thomas Jefferson at Colonial Williamsburg and around the world, will be on the Barter Theatre Gilliam Stage Thursday, February 7 as a fundraiser for the Historical Society of Washington County, Virginia. The program begins at 7; the doors open at 6, and music by local fiddlers “Sons of Liberty” and the Muster Ground Musick fife and drum corps will begin at 6:30. Ushers will be in Colonial period attire. This one-night performance by Mr. Barker brings Jefferson to life as he engages in an interactive dialogue with the audience. Mr. Barker has portrayed Thomas Jefferson at Colonial Williamsburg, Monticello, Philadelphia, Washington and other venues around the world since 1981. He combines theater with deep historical scholarship in order to relate Jefferson's life and times to our world today. Tickets are $25 for adults, $15 for students, and are available through Barter Theatre's box office.